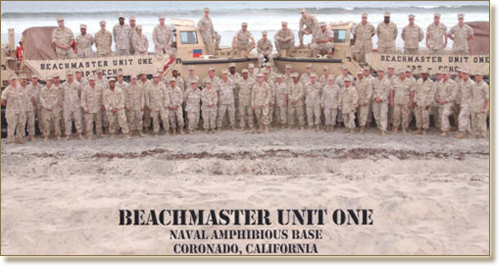 Beachmaster unit ONE is a unit under Naval Beach Group One and furnishes Beach Party personnel for the USMC Landing Force Shore Party. Beachmaster Unit ONE's mission is to conduct operations to facilitate the landing and movement over the beach of troops, equipment and supplies, and to assist in the evacuation of casualties and prisoners of war. Beachmasters maintain communications and liaison with designated Naval commanders and Naval control units in the Amphibious Task Group or Force; control all craft and amphibious vehicles in the vicinity of the beach from the three fathom line to the high water mark (i.e., within the "surf zone"); coordinate the reembarkation of equipment, troops, and supplies; determine and advise the suitability of beaches for conducting amphibious landings; control all salvage operation in the surf zone; keep appropriate Navy commanders apprised of wind and surf conditions; provide limited assistance to the landing force shore party in the defense of the marine Expeditionary assaults; and assist in Maritime Prepositioning Force (MPF) operations. Beachmaster Unit ONE has nine officer billets and 118 sea and 29 shore duty enlisted billets, not including the 22 Sailors of Detachment Charlie from Encino, CA who were mobilized to active duty this February. Shore duty personnel (YN, HM, IT, BM, CM, SK, GM, and non- rated personnel) perform a wide variety of important functions to support the command's sea and shore duty personnel and its' tactical vehicles and equipment. The sea duty element contains four Beach Party Teams, with 20 enlisted members (BM, IT, SM, HM, CM, and non rated personnel). Beachmaster Unit One also maintains a forward deployed detachment of 25 personnel in Sasebo, Japan. Each Beach Party Team is led by a second tour Limited Duty Officer or Chief Warrant Officer and is equipped with two lighter Amphibious Resupply Cargo, 5 Ton (LARC V) amphibious vehicles, a five ton truck, and other tactical vehicles for stowage and movement of team equipment. Beach Party Teams regularly deploy to the Western Pacific and Indian Oceans embarked on the ships of Amphibious Ready Groups. When not deployed, Beach Party Teams routinely participate in THIRDFLT amphibious exercises and provide a wide variety of support services at the Naval Amphibious Base, Coronado and throughout the Southern California Operating Areas. The type of services Beachmasters provide include: LCM coxswain and student training or Expeditionary Warfare Training Group (EWTGPAC) operations; Offshore Petroleum Discharge System (OPDS) operations; Training Availability (TSTA) work up cycle; and causeway operations (causeway insertions and retractions). 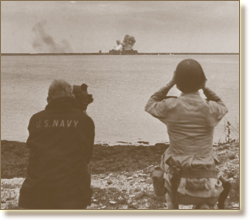 The bonding and respect between the young and old amphibious Navy was moving and historically significant. 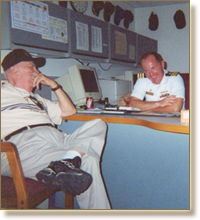 World War II veteran Norm Hartline is having a congenial conversation with Commander Harrington following formal ceremonies. I want to again thank you and your sailors for such a warm reception afforded our 6th Beach Battalion group over the past two days. Your kind words, reception, and memorial was very moving. On the flight home last evening, a gentleman in the row behind me, tapped me on the shoulder and asked if I had seen the San Diego paper article about BMU one, to which I replied that I had. After our landing in Tucson, I stood up and told him that I appreciated his calling to my attention the article and that it just proved to me that ALL the young people in the world had not gone down the drain. That I was honored to be associated with such fine young men and women. Norman Hartline 6th Beach Battalion Assn.